Home Articles What’s the largest number in the world? What’s the largest number in the world? The only problem with infinity is that it isn’t a number as such, as demonstrated by the conversation below between two bright sparks. Conversation goes on like this for what seems like an infinite amount of time until neither bright spark has arrived at the world’s biggest number. Before long the two bright sparks have realised that infinity is not really a number at all, it is more of a concept. What no one has told the two bright sparks yet is about the shocking idea that there are different sizes of infinity! So how do we calculate the largest number? The simplest way of creating a set of numbers which is infinite in size is by counting up in whole numbers. This set of numbers is called the natural numbers and obviously it is infinite in size as we can carry on counting forever. The symbol is used to label this set and it stands for ‘natural numbers’. The set is also infinite in size, but appears to contain one less number than . Are they the same size? We can show that and are in fact the same size by showing that there is a one to one correspondence between the elements of and the elements of . Up till now we would have said that the size of was simply infinity, which is written like a number eight on its side: . However we are about to find out that there are different sizes of infinity, and so we now label the size of as being which is pronounced as ‘aleph zero’. is the smallest size of infinity, and our set also has size . There are many other sets of numbers which have the infinite size of . These include the set of positive even whole numbers, and also what is known as the set of rational numbers. Rational numbers are all the numbers which can be written as fractions. If a set of numbers has the size it is said to be countable. If we have a list of fractions they can be counted and the rational numbers are therefore said to be countable. How do we find a size of infinity which is bigger than ? Not every number can be written as a fraction. Numbers that can’t be written as fractions are called irrational numbers. Well known examples include and surds such as and . The decimal expansions of irrational numbers like (3.1415926535…) go on forever, and these numbers can never be written as fractions, even though people like to use as an approximation for . Let’s now look at the set of all numbers which are between 0 and 1. This set will include rational numbers such as as well as irrational numbers such as This set of numbers is clearly infinite in size, as we can always think of more and more numbers which are contained in the interval (0,1). 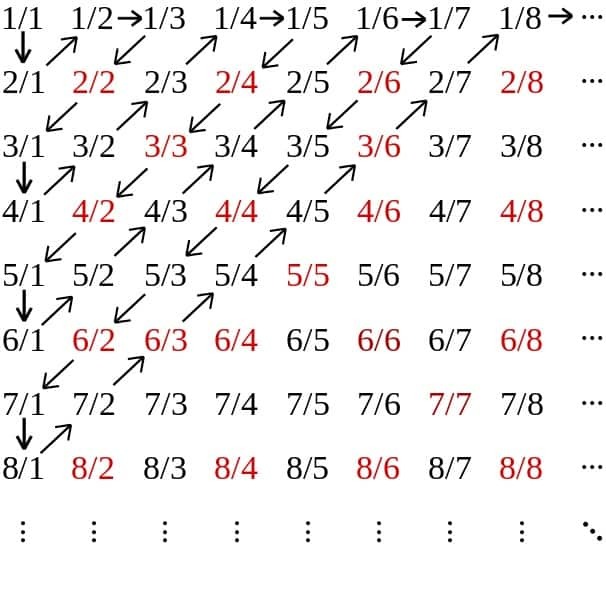 In 1873 a German mathematician called Georg Cantor invented a very clever proof that the set of all real numbers in the interval (0,1) has a size which is a bigger infinity than the size of the set of the natural numbers . Summary of Cantor’s famous diagonal argument. Cantor’s clever way of choosing a number not on the list. In its 1st decimal place it is different from the 1st decimal place of the 1st number in the list. In its 2nd decimal place it is different from the 2nd decimal place of the 2nd number in the list. In its 3rd decimal place it is different from the 3rd decimal place of the 3rd number in the list. In its nth decimal place it is different from the nth decimal place of the nth number in the list. This new number is clearly not on the list and Cantor had found a contradiction – Cantor showed that you can never make a one to one correspondence between the natural numbers and the real numbers in the interval (0,1). Cantor had proved that the size of the real numbers is bigger than the size of the natural numbers! The real numbers are uncountable! There are different sizes of infinity! In conclusion, the answer to the question of what is the largest number in the world is not straightforward. In a nutshell, there is no largest number, you can keep counting forever. But you can also find two groups of numbers – both infinite in size, but also different in size to each other. It is really incredible to think about! This article has only begun to scratch the surface of this fascinating and mind-boggling topic. If you want to read further, try ‘The Continuum Hypothesis’ in Plus Magazine. If you choose to study mathematics at degree level, you will have the chance to study what is known as set theory, covering in more detail the topics discussed in this article. How can three or more objects be kept in the air when you’ve only got two hands?